I’ve got a cheat card for Me Made May… my Luzerne jacket it being worn all of the time! So I included it on day two (the first day I actually left the house) and I’ll not mention it again… but just assume I’m probably wearing it. So then what things have I worn this week which are me made? On day one I finished off a day of painting by having a hot shower and curling up in my owls jumper… can we say cosy as hell? Day two was when I reported my Luzerne jacket, but it was a twofer as I also wore a satin crepe top (New Look 6483) which is one of my favourite work tops. 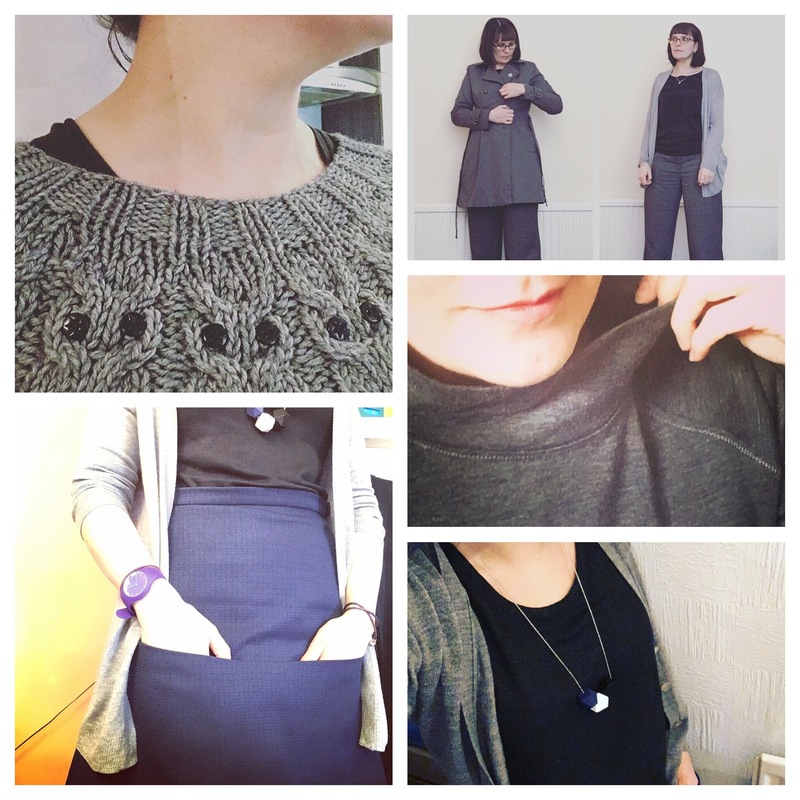 Wednesday and Thursday was just a rtw pair of days… workwear tends to be (maybe that’s where my wardrobe gaps appear). On Friday I was meeting the girls after work so I wore my kangaroo pocket skirt. This is the one I ripped off from Vogue 1247 which isn’t in print anymore. I have some serious love for this skirt!! Saturday was my scruffing around the house in cosy-wear kind of a day so I had on a much worn Toaster sweater… then I found out my lovely SO had bought us cinema tickets for a last minute date night (just so you know, Guardians of the Galaxy II is seriously funny), so I changed into some outdoor clothes and put a tweedy Scout tee over some skinny jeans. So there’s my week one, and it’s clear I have lots of not work clothes, but not many work clothes… stay tuned to find out if that’s a trend… I bet you didn’t expect that cliffhanger (ha ha ha). Previous Post The most complicated simple socks in the world!